The stalwart Prospector team has been busy. Since our last post we have covered over 600 nautical miles and have 408 nautical miles to go. In that time, we have done 8 jibes and 4 spinnaker peels. There has been a lot more for the crew to do as compared to the first half of the race. Now, finally, as we close in on the finish, we have gotten the stronger winds that our big silver sled craves. Until this morning the wind has been playing hide and seek with us. A promising 12-15 knot wind Tuesday pm, gave way to a 7-10 knot wind overnight. Wind speeds picked up again Wednesday am, only to give out again in the afternoon. On and on it has gone with the crew buoyed by the strong periods and working hard to keep Prospector moving when the winds get light. As the fastest boat in the fleet we give a lot of time to our competitors on handicap. With enough wind to get on step we are competitive but in semi planning conditions it’s a lot more work. For example, our ORR rating is 1.359. Pyewacket’s ORR rating is 1.15x. This means that the ORR rating system expects all things being equal we will sail 20% fast than Pyewacket. It is hard in the lower wind ranges to achieve this. But, when the wind picks up we get up and go. Since early this morning we have enjoyed the 15-17 knot wind speeds the forecasts have been predicting. Suddenly, we are blitzing along at speeds of 15-20 knots and our handicap is no longer an issue. Today’s stronger winds are arriving just in the nick of time. We are running out of race course and in a dogfight for several trophies. As things stand we are leading in the race to have the fastest elapsed time without handicap. We are contending to be first boat overall to finish, currently second but gaining fast. We are third in ORR overall and ORR Class E, both to Pyewacket and Blue. Pyewacket is going to be tough to catch, but we have a chance to pass Blue. The key to protecting our current standings and moving up the leaderboard where possible, is simple, SPEED. We currently have it and we are hoping it will last to the finish sometime tomorrow pm. Our lives onboard Prospector are governed by two sets of numbers. One is the clock. The other is our sailing performance stats. The two interact with each other in different ways. Our daily lives are governed by the clock. To begin with it’s a race we want to get there first. Secondly, we each stand 3 four hour watches each day. These watch schedules govern our day. Every hour the watches rotate, two go on, two go off. We are paired with our opposite on the other watch. Our watch captains, Paul McDowell and Dave Scott change on the 12’s,4’s and 8’s. Our navigators Larry Landry and Artie Means change at 6’s,10’s and 2’s. There are at least 8 on deck at all times and 10 during a watch change, so we try to coordinate any maneuvers at the top of the hour when there are more hands available to help. Often there are one or two other crew members on deck resting or avoiding the heat down below. For some maneuvers, like sail changes all crew are brought on deck. Off watch you eat, tend to personal hygiene, and sleep. Not necessarily in that order. At all times of day, we obsess over our sailing performance. We are constantly trimming and tweaking to improve. Prospector has 17 B&G displays, each displaying 1-4 pieces of data. We have two pc’s that display both visual information and more numbers than you can count. There are 2 iPads on deck to monitor all the information available while on deck. Artie and Larry are constantly looking at wind speed and direction data to plot our fastest course to the finish. The real assessment of our hard work are the hourly position reports that tell us if we have gained or lost against our competitors and what they are up to. Over the past 36 hours we have spent a lot of time playing with squalls. Handling these squalls well or poorly can mean the difference between winning and losing this race. As one approaches, we try if we can, to get in front of it to ride it down the course. If we can’t get in front of it we consider either pushing straight through it, if near the front or middle, or if not, jibing away if near the dead air zone at the back. Sometimes they just disappear as quickly as they came with no effect. It is a constant guessing game to try to gauge the strength and direction of each squall, whether it will help us, hurt us or leave us alone and what we want to try to do with it. We try to wait as long as we can to make our decision on what to do with each squall. This allows us to learn as much as we can about it before committing to a specific strategy. We are extremely sad to report that Matt Landry’s drone, named Near Miss, crashed in the mid Pacific Wednesday morning during its second offshore flight. The success of the initial flight which produced some spectacular footage, a small portion of which was posted online, emboldened Matt to be more aggressive in his approach yesterday. He was flying the drone further forward on the windward side of the sail plan when the boat headed up a wave and the drone disappeared behind the spinnaker, faced with the risk of tearing up one of our big new kites, he reduced the altitude of the drone and tried to fly it away from the sail. The lack of altitude proved fatal when the disturbed air from the sails caught the drone and Matts attempt to pour on the power to fly away from the boat only hastened its demise. No rescue attempt was mounted. Twenty-four more hours into this 20th edition of the Pacific Cup and we have continued to gain clarity on how much of the fleet may end up once all is said and done. With several boats beginning to line up their final approaches to the Hawaiian Islands, Charles Devanneaux and co-skipper Matthieu Damnerval look to have re-staked their claim to being the first boat over the finish line. After much uncertainty due to temporarily slowing down in light winds while the fleet's fastest boat came screaming up from behind, the two Frenchman on the revolutionary new Beneteau Figaro 3 now look set to finish what they started and be the first boat into Kaneohe. Just behind them, plenty of other storylines continue to play themselves out. Prospector may not be the first boat into the barn, but with the fleet's scratch boat still making 15 knots and now under 500 miles out, she should be in late Friday or early Saturday and remain in pole position to claim the Pacific Cup overall victory. Behind the Mark Mills designed mini-maxi, Hector Velarde's Andrews 70 Runaway has now just barely moved into second overall in the Pac Cup rankings, having displaced the leading Express 27, Loose Cannon, overnight. While Prospector and Runaway have moved into podium positions in the overall rankings, it's still Roy Pat Disney's Andrews 68 Pyewacket which sits atop the race's premier BMW of San Rafael E division, though that lead is no longer insurmountable as Michael Schoendorf's Riptide 41 Blue has made massive inroads into Pyewacket's corrected time lead and now sits just eight and a half hours back on corrected time; not ultra-close but not out of striking distance either. With both boats having multi-time Olympic medallists aboard and stacked deep with talent, this is a fascinating race between two very well sailed boats. Prospector remains third in division with Runaway in fourth. Working back down through the fleet, we see that the Pasha Hawaii D division has even further compressed and for the first time since departing San Francisco, we may soon have a new leader. After jumping out to a resounding lead in the very early stages of the race and then maintaining for much of it, Gregory Mullins' Farr 52 Zamazaan, stocked with several of San Francisco's top professional sailors, is now relegated to play defense against the pair of ultra-quick 32-footers that look destined to shake up the rankings in D division. Once past the light upwind and sheets-cracked reaching stages of this Pacific Cup, Chris Kramer's Six Brothers and Rufus Sjoberg's Rufless have been on a steady rise up through the ranks, and with both boats reveling in the off-the-breeze surfing conditions that define the latter stages of the Pacific Cup, are now attempting to take ownership of the D division's top spot. As of this morning, Six Brothers and Rufless were just 4 hours and 7 hours behind Zamazaan on corrected time, after both displacing J World's Hula Girl, and knocking this division's defending champion off the podium and into fourth place. With the D fleet boats passing the halfway point yesterday, there should still be plenty of race track left for the Columbia Carbon 32 Six Brothers and Melges 32 Rufless to burn past Zamazaan, though we don't know which order they'll be in when they do it. Rufless and her crew certainly know the way to Hawaii, but Six Brothers won't be easy to pass, with the oftentimes under-appreciated Tim Kernan design having proven itself to be an absolute weapon in the ocean. Alaska Airlines C division was predicted to be a barn-burner from the get-go, and it has exceeded even our wildest expectations. Phil Wampold's J/92 Zaff, full of young Melges sailing Canadians, has sailed an absolutely incredible race thus far, but as we have been long anticipating, she is beginning to have a hard time handling her competition in the dead-downwind running stages of the Pacific Cup. Morale is certainly high on Alex Simanis' Evelyn 32-2 Poke and Destroy, with the Seattle based crew beginning to look unstoppable in their quest to move atop the leaderboard in one of this year's most competitive divisions. The team is having the time of their life as they continually chip away at Zaff's lead after doing the same to Sweet Okole earlier this week. Poke and Destroy is now more than seven and a half hours clear of Okole, and less than three and a half hours behind Zaff on corrected, and moving very well under their A2 spinnaker in 12-15 knots of breeze. After bailing the media guy out with a much needed and last minute ride to the train station on the first day of starts, we're happy to have the chance to shower Poke and Destroy with triumphant superlatives. Karl Haflinger's J/35 Shearwater remains atop the big Weems & Plath B division, which still has more than half the race to sail. Since being the slower division to start on arguably the slowest day of starts, this Pacific Cup is proving to be the race where the fun just won't stop as B division's backmarkers are now in a race against the clock if they are even to make it into Kaneohe before the awards. Wyatt Jones' Davidson 44 Imagine isn't far off the pace, just four hours back as of this writing, while The Fugitive, Alessandra and Free also remain well in contention. Coral Reef Sailing Apparel A division is once again led by race stalwart Jim Quanci and his classic Cal 40 Green Buffalo. After compressing and consolidating for days with Bob Horton's Highlander, the two Cal 40's briefly engaged in a match race yesterday, which predictably went in favor of veteran skipper Quanci and crew. Again displaying how close this A division is, recent division leader Highlander has moved from first place to last place, as there's virtually nothing in it on corrected time, with second through fourth virtually tied. As anticipated, Rebecca Hinden's Express 27 Bombora is again beginning to make moves up the leaderboard in the closing stages, and we would suspect the little red ultralight to pull away from Morgan 382 Eliana and Highlander. With close to 600 miles left to sail for the A fleet boats, there's still plenty of time for one good day of surfing - or even a prolonged squall - to help eat up the two and a half hour deficit to division leader Green Buffalo. The fleet's two doublehanded divisions continue to excite with both divisions still up for grabs after a number of lead changes. 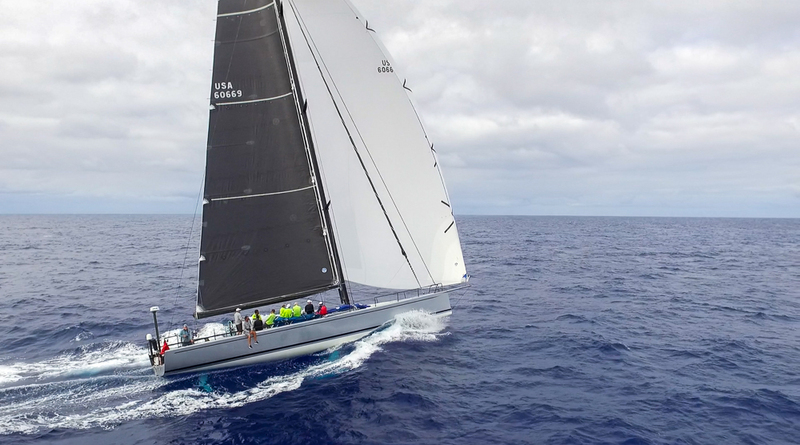 Loose Cannon remains atop Pau Maui Vodka/ DH1 (and in third overall) with a lead of nearly five hours over Motorcycle Irene, though Irene has begun her late race charge and now sits firmly in second place with nearly 500 miles left to sail for the Express 27s. Irene co-skipper and professional sailor Will Paxton has been a part of countless divisional and overall winning efforts in both the Pac Cup and the Transpac, and can never be counted out in a Hawaii race. While we lauded Motorcycle Irene as heavy pre-race favorites, and were vindicated in that prediction in the early reaching stages of this race, Loose Cannon, Alternate Reality and Fired Up! have all proven that the level of competition in this fleet is incredibly high, even higher than we thought, and all of the crews deserve a heck of a lot of credit for sailing absolutely phenomenal races. Mount Gay Rum/ DH2 has finally seen pre-race favorite and two-time defending division champion Wolfpack, piloted by husband/ wife duo Bill and Melinda Erkelens make their move and assume the lead over Lester Robertson's Moore 24 Foamy. Both crews have been racing to Hawaii longer than much of their competition has been alive, and it shows. Playing the south hard since day one, we all watched as they faded deep down the rankings early on with the J/105 Abstract looking good up north. As is usually the case however, the northerly boats faded and on cue, these ultra-experienced race veterans cashed in their chips to make late race moves to the top of the leaderboard. Separated by less than an hour on corrected time as of this writing, Wolfpack has under 400 miles left to sail, while Foamy is about a day further back. Frederic Berg and Mikey Bacon have been playing the middle ground on the Antrim 27 Bacon Berger for nearly the entire race and still have an outside shot at winning the division, and currently fill the final podium position in this hard-fought race. The quickest cruisers in the Kolea cruising division are now under 500 miles from Kaneohe, and it is beginning to look more and more like Matt Solhjem's Hanse 505 Anais is going to pull of the upset and take down sistership Outremer; a result of Outremer's northerly routing and parking it up in the big wind hole that claimed many of the first wave of starter's top boats including Green Buffalo, Abstract and A Fond le Girafon. Paul Koenig's Jeannuea Sun Odyssey 40.3 Bear Boat rounds out the podium with the first arrivals scheduled to be get in over the weekend. The media team will be based at Kaneohe Yacht Club from tonight, awaiting the fleet's first boats, which should start trickling in as early as Friday afternoon. One thing is for certain about the 2018 Pacific Cup; at no point has it ever been a boring race. With constant weather changes, never-ending lead changes, gut-wrenching tactical decisions to be made and huge splits in the fleet as a result, this race is poised to come down to the wire before most, if not all, of the results are decided. For your Pac Cup media team, we very well may need counseling once this race is over as a result of all of the emotional ups and downs of this prolonged adventure that we call the Pacific Cup. Just when we thought a foiling new Beneteau may be first over the line and a storied old green boat with a trophy case full of hardware would add another big one, they both got nearly becalmed up north while a mini-maxi and a west coast sled from the 'bad' start day slipped away from the coast unscathed and began a meteoric rise up through the ranks. Two days ago, we watched the Mark Mills designed 68' mini-maxi Prospector with interest as they began legging out on their fleet and potentially putting themselves in a position to be first over the line and spoil A Fond le Girafon's Cinderella story. One day ago, chatter of them potentially being a contender for the overall Pacific Cup (though likely not winning their division, more on that later...) began circulating throughout the Pac Cup race team, and now it's beginning to look like a real possibility - if not probability - that Prospector could well claim first to finish, fastest elapsed time and the Pacific Cup overall. With renowned navigator Artie Means calling the shots on routing, the boat is likely to leave very little time on the table when making her way down the race course and into Kaneohe. After the way this race has evolved however, we're not making any bold predictions until boats are nestled in the barn. While Prospector is beginning to look like a very real contender to win the Pacific Cup overall, they will likely not win their division as the mighty Pyewacket is putting in a performance for the ages to take a commanding lead in the BMW of San Rafael E division. Due to somewhat of a technicality however, Pyewacketwill not be eligible for the Pacific Cup overall award as a result of flying a specialty reaching sail that is legal under the ORR rule under which the big boats are racing, but not under PHRF which is the rule that is used to decide the overall Pacific Cup winner. Having said all of that, Pyewacket and her crew of world-renowned sailors including Volvo Ocean Race superstarts Tom Addis, Stu Bannatyne and Kaneohe's own Mark Towill, not to mention 5-time Olympic medallist Torben Grael, have been absolutely on fire since the start and are building up a solid cushion over her divisional rivals, including the other three 'sleds' in the E division, all of which are faster rated boats. One reason for Prospector's constantly increasing chances of winning the overall Pacific Cup award is that current overall corrected time leader Green Buffalo,Jim Quanci's green Cal 40 that has led since the start, has been sailing below 5 knots of boat speed for more than a day now. Making matters even worse, theBuffalo is pointed south, both on the race course and on the leaderboard. Putting in a daily run of just 65 nautical miles (made good) yesterday, she is on a slippery slope that could see much of the Express 27 fleet, and potentially her Cal 40 rival Highlander move past her in the rankings. Green Buffalo isn't alone either; the Beneteau Figaro 3 A Fond le Girafon, Hanse 505 Outremer and the J/105 Abstract have all been on the same slow-moving pain train, though are just now beginning to re-acclerate. Playing the north very rarely pays dividends in a Hawaii race, and while it looked good while it lasted, it now begins to look more and more like the southerly boats will reap the rewards of making long-term investments early and not picking the low-hanging fruit and easy miles that existed up north in the early stages of this race. As a result of Douglas Pihlaja's J/105 Abstract getting stuck up north and fading fast in the rankings, the DH2/ Mount Gay Rum doublehanded division has been blown wide open and could now be a four-way battle between four quite different boats; Moore 24 Foamy, Santa Cruz 27 Zipper, Antrim 27 Bacon Berger and the Donovan 30 Wolfpack. Lester Robertson sailed a Moore 24 to Hawaii 38 years ago in the first-ever Singlehanded Transpac and all these years later, Lester is still doing his thing. Owning the south since day one, the little Moore has slowly but surely worked her way up the leaderboard and as of this writing holds a very small margin, just 30 minutes on corrected time, over Alexia Fischer's Santa Cruz 27 Zipper, who has had tracker issues for the duration of the race and does not display properly on the race's YellowBrick tracker. Just a few more hours off the pace, Bacon Berger, the Antrim 27 sailed by Kaneohe Yacht Club Commodore Frederic Berg and Mikey Bacon is more or less gybing down the rhumb line now, while running fairly hot angles and making great speed. Now taking another hitch south is perennial contender and two-time defending division champions Bill and Melinda Erkelens on the Jim Donovan-designed MORC 30 Wolfpack. With one boat working the rhumb line, two boats in the middle and one boat playing the south hard, this race is an absolutely fascinating race between some phenomenal sailors who are pulling out every trick in the playbook. Our other doublehanded division in this race, the DH1/ Pau Maui Vodka division promised to be a close one from day one, and it certainly has not disappointed. A six-boat one-design Express 27 division, the fleet has stayed in pretty close formation south of the rhumb line and continues to see four boats consistently trading positions on the leaderboard. Alternate Reality is leading at the moment over Loose Cannon, Motorcycle Irene and Fired Up! - in that order - but we don't recommend reading into it too much as the positions are likely to have shuffled again by the time we write our next update. In the wake of the Volvo Ocean Race, this is the best one-design ocean race going right now. One can't forget about Rebecca Hinden's fully-crewed Express 27 Bombora, who has faded slightly on the overall leaderboard but remains a top contender and may even be able to overtake Green Buffalo in the Coral Reef Sailing Apparel A division, after she gained a staggering FIFTY miles on Green Buffalo in the last 24 hours. The Weems & Plath B division has also seen the boats at the top of the leaderboard compress a bit in the corrected rankings, though Benjamin Rummen's Farr 1220 The Fugitive currently remains atop the leaderboard, though the Swan 46 Free, Davidson 44 Imagine and Grand Soleil 50 Alessandra are all just a handful of hours behind on corrected time. Unfortunately, we must wish our friends on Paul Eichen's Farr 44 Companera a warm aloha, as they have retired from the race, bound for San Diego with rudder issues. All souls onboard are safe and the situation is said to be 'quite manageable'. Another thrilling battle is that of the Alaska Airlines C division in which Phil Wampold's J/92 Zaff and Dean Treadway's famous Farr 36 Sweet Okole are nearly tied on the tracker's corrected time calculations, though are sailing quite different routes. Okole appears to have just set an A2 or similar and is beginning to soak down to the rhumb line, while Zaff runs just south of rhumb and the Hobie 33 Aloha and the Evelyn 32-2 Poke and Destroy are match racing down the rhumb line to fill the final podium position. One would expect Sweet Okole to benefit from her new rig and assymetrical spinnaker inventory in the later running stages of this race, though again, we're not making any bold predictions in this race as it's proven to be a highly competitive division as originally anticipated. The Pasha Hawaii D division continues to be controlled by Gregory Mullins' Farr 52 Zamazaan, who has proven themselves to be the class of the fleet in the early stages of this race, jumping out to a commanding lead in division while J World's Hula Girl remains second in fleet, though Chris Kramer's Columbia 32 Six Brothers continues to impress and slowly make gains on Hula Girl as the breeze moves aft and the smaller, lightweight sportboat can begin surfing earlier than her larger, heavier rivals. The Kolea Cruising division has begun to see some real action on the leaderboard as Emmanuel Sauquet'sHanse 505 Outremer slowed alongside the other northerly boats, allowing her sistership Anais to make inroads into her once commanding lead. Outremer is slowly getting back up to speed, but still remains two knots slower than her sisitership who is well south of her, and continuing to head further south, towards the stronger breeze that may allow her to continue to make gains against her once-dominant sistership which sails with Vendée Globe superstar Tanguy de Lamotte onboard. Paul Koenig's Jeanneau Sun Odyssey 40.3 Bear Boat continues sailing at more than 7 knots, near the rhumb line and relatively close to Anais, and is currently rounding out the cruiser's podium, while James Peo's Jeanneau 379 Knot Behaving also has a steering system that is not behaving. The crew reports that they are running under emergency rudder at a leisurely 5 knots, though they don't seem to perturbed. Things are definitely looking up. About 8pm last we put up our big A2 Spinnaker and began sailing downwind after two and a half days of reaching. Wind speeds remains light of the forecast but have picked up to 12-15 knots from 7-10 knots. We are just past the half way mark of the race with less than 1000 nautical miles to go to Kanoehe. At the downwind angles we are now sailing the boat is a lot flatter making life aboard much less acrobatic. It has warmed up significantly and, yes, we have finally broken out our new Prospector board shorts. It has been a busy day aboard our big silver sled. Oatmeal for breakfast followed by some preparatory work for the squalls we might encounter down the road. Matt Landry did a little aerial work to rig a letterbox take down line, so we can get the big white thing out front down in a hurry if we need to. He followed that up with a salt water shower out on the prod to rig a quick release for the tack. Happily, he reported, the water has warmed up considerably as we get closer to Hawaii. Once Matt rinsed off and dried up he broke out his drone. We all watched anxiously as it was launched and circled around us, taking some video, wondering if Matt would be able to retrieve it. It hovered around, mostly down wind and abeam of us, for a few minutes as we powered along at 13 knots. After a couple of approaches Matt maneuvered the drone close enough to the stern and brought it back onboard to a round of cheers. Lunch of mac n cheese with spam, yes that spam, was enjoyed by all up on deck in warm conditions. With the kite up, we have moved our sail stack back and now have a very comfortable faux Barcalounger on the lido deck that has become a highly coveted seating location. With the temperature up, layers are coming off. Wearing fewer layers and lighter gear is also lifting morale. The only blot on this otherwise pretty picture is that it is becoming quite hot and pungent below decks. Prospector takes off down wind. We are sailing at 13-16 knot boat speeds in 12-13 knots of wind. Over the last little bit, we have averaged 15 knots of boat speed. Our hourly position reports, which are delayed 6 hours just like the one some of you are watching at home, have been uniformly good. We have passed all of the Wednesday and Thursday starters and over the next 36 hours will pass most of the Monday starters too. We are extending distance and bearing on the other boats in our class though Pyewacket continues to correct out ahead of us. We also are keeping a close eye on Blue which has been gaining a bit after moving into reaching/running mode. We are in the slot car phase of the race. Going as fast as we can in our lane to a jibe point a few hundred miles north east of Hawaii. This year’s race has been a little unusual. The thermal low at the start threatened light winds and forced us south from the start. Once we got there we saw better wind speeds to the south and headed that way to try to take advantage of it. Now we are working around an unusual Pacific High that is really three highs in the shape of a sausage. The flat isobars across the course mean we will be a lot further south and closer to Hawaii when we make the jibe for home. We have a nice race going. This section of the race, where we can post speeds in the high teens, as opposed to the first third of the race where we were going 9-10 knots, plays to our strengths. With half the race to go and the advantage swinging our way we are pressing hard to move up the leaderboard and try to win the day. Tery, Quinn and Lu for the care they take of Prospector and having her perfectly prepped and ready to go. The boys improve her constantly and every time we get onboard she is a better boat than the one that finished our last event. Colette, the Minister of the Interior, water maker, and freeze-dried maestro. She is a saint for putting up with us. Dave Scott. Yoda. ‘nuff said. Artie Means. An all around great shipmate, electro wizard, teacher and mentor. Keep an eye out for our drone footage and some photos to follow.